Lucas di Grassi is a new champion of Formula E! Lucas Di Grassi is a new champion of the FIA Formula E Championship. The Brazilian driver of the ABT Audi team clinched the title after finishing 7th in the Montreal ePrix race 2. Di Grassi finished 3rd in the maiden season of the series, he was a runner-up in the season 2 and eventually became a champion form the third attempt. 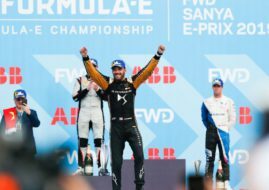 Finally, the winner of the season-closing race is Techeetah driver Jean-Eric Vergne. Sam Bird was fastest in qualifying while the other drivers who qualified for the Super Pole Shootout were Felix Rosenqvist, Jean-Eric Vergne, Nick Heidfeld, and points leader Lucas Di Grassi who entered the last race with an advantage of 18 points to reigning champion Sebastien Buemi who again did below the expectations and finished 13th in qualifying. However, Rosenqvist was the fastest in Top 5 Shootout while Bird, his rival in the battle for the 3rd position in the Championship, had to settle for the 2nd starting positions. Vergne, Heidfeld, and Di Grassi started from positions 3 to 5 respectively. When the race has started, Di Grassi was very cautious and he dropped to the 7th position. Buemi’s bad luck continued after Felix Antonio da Costa hit him from behind and damaged the Renault e.Dams car. The Swiss driver had to pit and dropped to the back of the grid what ended his title dreams. Now Di Grassi just had to keep out of any trouble. At the same time, Felix Rosenqvist kept his lead to Jean-Eric Vergne, Nick Heidfeld, and Sam Bird. While Buemi and Nico Prost were at the bottom, Di Grassi and Daniel Abt were running 7th and 8th respectively. Interestingly, they haven’t pushed too hard even after having a chance to bring Teams’ Championship title to ABT Schaeffler Audi Sport team. After the pit stop, Rosenqvist still was a race leader and was chased by Vergne, Bird and Jose Maria Lopez. At that moment, Di Grassi dropped to the 9th position but still was very safe after Buemi was at P18. On lap 30, Vergne took the lead from Rosenqvist and won the race. Interestingly, this is a maiden ePrix victory for the experienced French driver. Felix Rosenqvist finished 2nd and clinched the 3rd position in the final standings what is an excellent achievement for the rookie driver, while another newcomer Jose Maria Lopez completed the podium. The Renault e.Dams drivers were the biggest losers in the final race of the season after Prost retired in the second half while Buemi was 11th. However, the third consecutive Teams’ Championship title is surely more than a consolation for the French team. The 2017-2018 FIA Formula E Championship season kicks off on 2nd of December with a double header in Hong Kong.